Statistically, being the president of the United States is one of the most dangerous jobs in the world, since four have been assassinated (Abraham Lincoln, James Garfield, William McKinley, and John F. Kennedy). In addition to the presidents that have actually been killed while in office, there have been a myriad of unsuccessful attempts to kill U.S. presidents. One of these happened on February 15, 1933, when Giuseppe Zangara tried to kill President-elect Franklin D. Roosevelt in Miami, Florida. On February 15, 1933, just over two weeks before Franklin D. Roosevelt was inaugurated as President of the United States, FDR arrived at the Bayfront Park in Miami, Florida around 9 p.m. to give a speech from the back seat of his light-blue Buick. 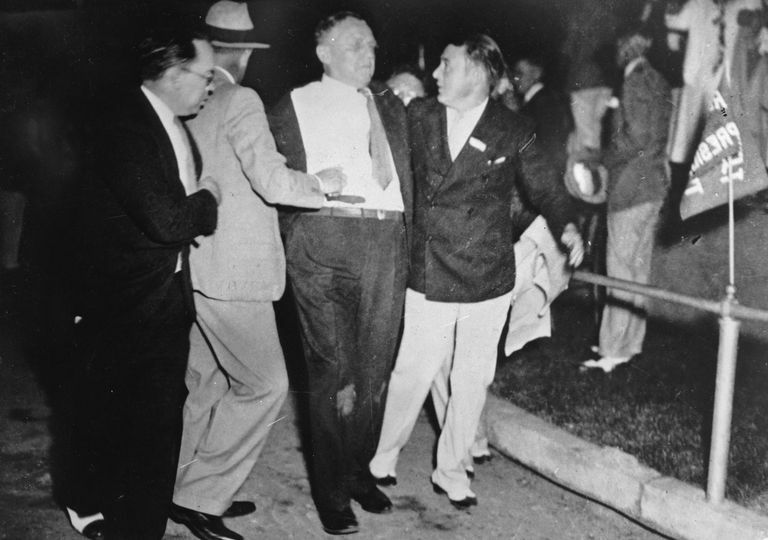 Around 9:35 p.m., FDR finished his speech and had begun talking to some supporters who had gathered around his car when when five shots rang out. Giuseppe "Joe" Zangara, an Italian immigrant and unemployed bricklayer, had emptied his .32 caliber pistol at FDR. Shooting from about 25 feet away, Zangara was close enough kill FDR. However, since Zangara was only 5'1", he couldn't see FDR without climbing up on a wobbly chair in order to see over the crowd. Also, a woman named Lillian Cross, who stood near Zangara in the crowd, claimed to have hit Zangara's hand during the shooting. Whether it was because of bad aim, the wobbly chair, or Mrs. Cross's intervention, all five bullets missed FDR. The bullets, however, did hit bystanders. Four received minor injuries, while Chicago's Mayor Anton Cermak was mortally hit in the stomach. During the whole ordeal, FDR appeared calm, brave, and decisive. While FDR's driver wanted to immediately rush the president-elect to safety, FDR ordered the car to stop and pick up the wounded. On their way to the hospital, FDR cradled Cermak's head on his shoulder, offering calming and comforting words which doctors later reported kept Cermak from going into shock. FDR spent several hours at the hospital, visiting each of the wounded. He came back the following day to check on the patients again. At a time when the United States desperately needed a strong leader, the untested president-elect proved himself strong and reliable in the face of crisis. Newspapers reported on both FDR's actions and demeanor, putting faith in FDR before he even stepped into the presidential office. Why Did Zangara Do It? Joe Zangara was caught immediately and taken into custody. In an interview with officials after the shooting, Zangara stated that he wanted to kill FDR because he blamed FDR and all rich people and capitalists for his chronic stomach pain. However, when Cermak died of his wounds on March 6, 1933 (19 days after the shooting and two days after FDR's inauguration), Zangara was charged with first-degree murder and sentenced to death. On March 20, 1933, Zangara strode to the electric chair unaided and then plunked himself down. His last words were "Pusha da button!" *Joe Zangara as quoted in Florence King, "A Date Which Should Live in Irony," The American Spectator February 1999: 71-72. How Many U.S. Presidents Have Been Assassinated? Why Did John Hinckley Try to Assassinate Ronald Reagan? How Was President McKinley Assassinated?